Made of twigs, thread and feathers, dream catchers remain a gift of sincerity. They ensure infants and young children peaceful sleep and dreams while trapping nightmares. The bad dreams remain in the web until the light of day evaporates them into air, never to bother the sleeper again. At any given moment, Jamee Jackson shows bits of his 17 tattoos. Some are visible daily, some are not. 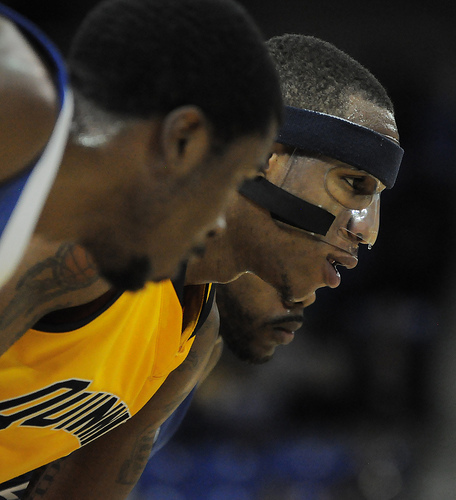 When he donned his Quinnipiac basketball jersey for the last time this winter, the first piece of art he got on his body showed on his arm, and it will show for the rest of his life. Jackson said the inspiration came after he began getting the phone calls that would change his life, the phone calls that would allow him to go beyond a high school graduation, the phone calls that would push him further than he or anyone in his family could have known. For Jackson, the dream that came to fruition was not only being able to play basketball at a collegiate level, but even the opportunity to receive a college education, one that will be complete come May 19. Growing up in Newark, N.J., Jackson’s mother sought to protect her children in an area that did not allow for carefree days of childhood. Jackson and his family moved around from New Jersey to Rhode Island and back to Newark for his sophomore year of college. The moves were in part because of job opportunities and in part because Jamee and “[his] brothers were bad,” he said laughing. “I always played basketball in the parks, but I never played organized basketball,” Jackson said. By his sophomore year of high school, Jackson began getting noticed by college scouts. He grew through basketball in order to move on to college, and according to head coach Tom Moore, once he arrived at Quinnipiac, the sport became a way for him to grow as a person. Sporting the blue and gold for the first time on a team in which James Feldeine, Justin Rutty and James Johnson filled roster spots helped Jackson find strong guides for his Bobcat beginning. Once the big names eventually graduated and the once-fresh faces became the leaders, Jackson recognized a change in him. Through the seasons, Moore sees both the good and the bad play a role in his athletes’ lives. As far as Jamee’s trying times, Moore thinks they have only made him stronger. 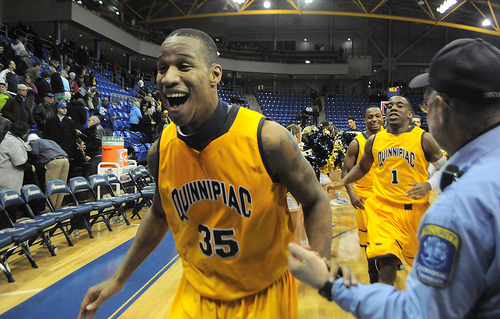 While his early days at Quinnipiac mirrored that of his childhood, Jackson’s opportunities only began on the court. His true defining characteristics are the product of his major. The legend of the dream catcher begins with the vision of a Lakota elder. A spider appeared to him and began to spin the web, explaining that the cycle of life from infanthood to old age. In everyone’s life, he explained, good and bad forces are thrust in all directions. The good forces are a guide, and the impressionable go with the bad forces to dangerous places. He still spun the web. When he finished, the spider explained that bad forces would remain in the web while good forces will be used to reach goals. On his way to a basketball career, Jackson steered away his own negative forces, and as a sociology major, he hopes to help other kids do the same. Ideally working with inner-city kids, Jackson hopes to be the positive force, guiding his mentees in a way he was not. Jackson already has experience with working alongside young kids with The Tom Moore Basketball Camp. Through his love of basketball and his will to help, Jackson already proves himself as a role model. Moore credits his effectiveness to his light-hearted, kid-like nature. “He’s an emotional, fun-loving kid who you love going to practice with, you love going to the gym with, you love going to games with,” Moore said. While Jackson said “he fits right in” with the kids, another Bobcat before him chose the same career path with a much different approach. Jeremy Baker, a 2010 graduate, also found a career in social work but with a more stern attitude, according to Moore. Despite their differences in their approach, Jackson keeps in contact with Baker and sees his impact. “He’s relentless, he’s tough and I kind of model that a little bit as far as my game,” Jackson said. Having seen both Jackson and Baker come through the program and the impact athletes have on children, Moore knows that “kids naturally look up to athletes,” and that this make their word that much more valuable when trying to mentor or resolve conflict. He also knows that as graduates, there are opportunities available that stretch far beyond what any classroom can prepare a student for. Whether Jamee goes overseas to further his basketball career or jumps right into social work, the “world is [his] oyster,” according to Moore. “It’s exciting and your path can go in a lot of different ways, and I think Jamee is no different than any college graduate nowadays,” Moore said. According to Native American legend, giving a dream catcher as a gift shows great respect and love. It means that someone cares so deeply that he or she wants to ensure peace of mind. Jamee Jackson’s dream catcher is almost complete. Some threads may be missing, therefore some negative energy may still trickle through as years go on. But there are always more dreams that will be filtered through to existence, no matter how big or small. As he sits weeks away from completing one such aspiration, Jackson is on the brink of a new hope. By passing down his faith to the children he has and will mentor, Jackson represents not only the product of a dream catcher, but also the giver of one. Through the field of social work, Jackson will help steer the kids that he meets on a path of good choices, one that will help them to catch their dreams too.